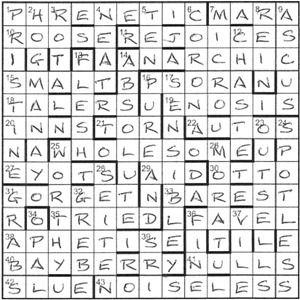 Syd Lexis has set a lot of puzzles over the years, mainly in the Enigmatic Variations series. This is only his fifth, and sadly last, Listener — he died in February this year. Some of his puzzles have had fun themes, as you’d expect from his pseudoplume, his 2008 Listener being based on YYUR YYUB ICURYY4ME. 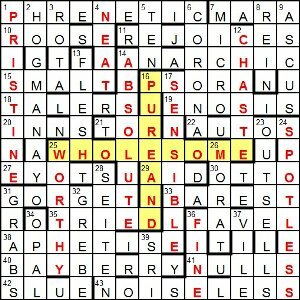 Here, we had extra letters in the wordplay for each clue, leading to a quotation from a 1984 novel by a Scottish poet. Strangely, nothing sprang to mind, so it was on with the clues. Getting 1ac PHRENETIC made me focus on the NW quadrant, and 2dn HOGMANAY, 5dn TEN and 6dn CORONA meant that I as off to a good start. I’ve come across the meaning of TEN used in 5dn before — “used indefinitely, a large number” — but to me, ten has never meant anything other than slightly more than 9 and not quite 11. 11ac and 14ac were REJOICES and ANARCHIC respectively, and suddenly I found myself heading down the right-hand side of the diagram. Unfortunately, the unclued entries at 12dn and 24dn meant that I couldn’t quite make it into the SE corner. So, just as PHRENETIC had started me off at 1ac, so NOISELESS helped me work my way up from the bottom. Now… when I say that I needed Google to verify its source, it wasn’t quite that simple. I googled the first part of the quotation and was surprised not to have Wikipedia or Wikiquotes thrust at me. In fact, a Powerpoint presentation entitle The Theory and Practice of Legislative Drafting at the top of the search results seemed such an unlikely place to look that it was about a quarter of an hour before I opened it. But there it was on slide 2. I am at a bit of a loss to understand why it was that such an obscure source was not signposted a bit more explicitly somehow. Of course, the end of the quotation, and indeed the other unclued entries, were pretty much self-evident, so one could reach the end of the puzzle, shrug and say “Well, I guess there’s a poem with those lines in it somewhere.” That is, unless you write blogs for Listen With Others and need to be a bit more thorough! All that aside, it was an enjoyable swansong from Syd Lexis, and what an appropriate creed for us all to try and follow. This entry was posted on 28 March 2014 at 5:00 pm	and is filed under Solving Blogs. You can follow any responses to this entry through the RSS 2.0 feed. You can leave a response, or trackback from your own site.